*Corresponding author: Nita Viwattanatipa, Department of Orthodontics, Mahidol University, Yothi Road, Bangkok, Thailand. Objectives: The objective of this study was to compare the effect of wire type, pH and immersion time upon mean corrosion rates of four orthodontic wires. d. Titanium-molybdenum alloy (TMA) were immersed in artificial saliva, either at pH 6 or pH 2.5. The time of test was either as-received or 90 days immersion time. Corrosion analysis was performed using linear sweep voltammetry. Results:3-way ANOVA statistical analysis showed that wire type, pH, immersion time and combination of these factors, both second order and third order interactions, accounted for significant differences of the mean corrosion rates. At baseline status, (as-received wires, at pH 6) post hoc multiple comparison test showed that the mean corrosion rates of NiTi > Aus >SS>TMA (P < 0.05). Interaction plots revealed that the corrosion susceptibility of these wires could be modulated by pH 2.5 and 90 days immersion time, with different extent across wire types. Under pH 2.5 and 90 days immersion time condition, SS showed statistically greatest increase of mean corrosion rates. However, TMA, Aus and NiTi mean corrosion rates were not different from each other (P<0.05). Therefore, interaction of pH and immersion time upon wire types could deviate the pattern of relative mean corrosion rates from the as-received status. Conclusion: Corrosion behavior was dependent on the interactions of alloy type and the environment factors (pH and immersion time). Variety of metal alloy wires are used in modern orthodontic treatment, such as, Stainless Steel (SS), cobalt-chromium, Nickel-Titanium (NiTi), Beta-Titanium (TMA), etc. These metal alloy wires are subjected to biodegradation in oral environments leading to corrosion. Although the risk is low, corrosion products such as nickel and chromium may cause sensitivities or allergic reactions during orthodontic treatment [1-5]. Other consequences may involve discoloration or roughening of surface leading to friction between the bracket and the arch wire [1,2]. Several intrinsic and environmental factors influence the corrosion reactions of orthodontic wires such as, types of alloys, surface roughness, surface coating, electrolyte, pH value, aging, immersion time and temperature [1,3,4,6-12]. Orthodontic appliances rely on the formation of a passive surface oxide film to resist corrosion. The addition of nickel and chromium in stainless steel alloy imparts corrosion resistance. The chromium in the stainless-steel forms a protective, passivating oxide layer (Cr2O3) that provides a barrier to oxygen diffusion and other corrosive environments . The Australian wires are special type of high tensile stainless-steel wire, with rougher surface than other stainless steel [13,14]. The corrosion resistance of nickel-titanium wire is due to the large amount of titanium in its compositions with passivation surface film of several oxides (TiO, TiO2, Ti2O5) . The beta-titanium alloy wire has excellent corrosion resistance and biocompatibility which is due to the presence of titanium oxide (TiO2) [2,15,16]. Previous studies agreed that TMA wire possesses better corrosion resistance than other orthodontic wires [7,17]. Stainless steel showed greater corrosion than TMA [17,18]. However, the relative corrosion rates of NiTi were inconclusive . Hunt et al. 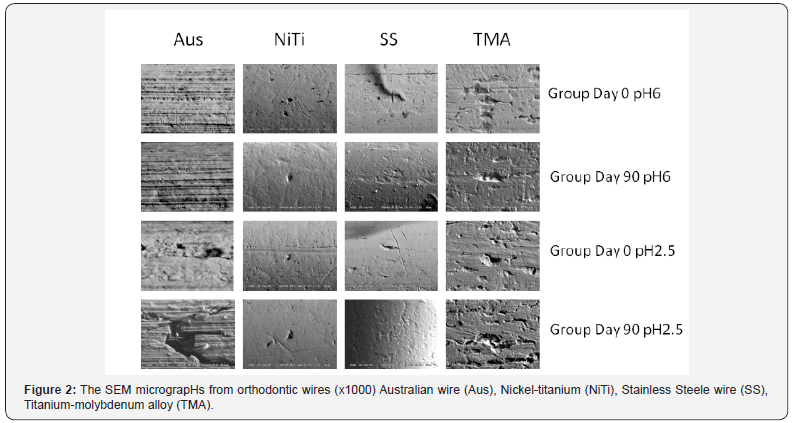 reported the relative corrosion rates of the as-received orthodontic wires ranking from highest to lowest as NiTi > Australian stainless steel > TMA > chrome-cobalt. Sarkar et al. showed relative corrosion rates of NiTi > Stainless steel > TMA. On the contrary, Rondelli  reported that NiTi possessed greater corrosion resistance than stainless steel. Kim  reported that nickel titanium alloy wires showed large variability in corrosion resistance. Due to the information at present time may not be enough to ascertain how a given orthodontic wire alloy will undergo corrosion under complex environmental conditions. Few articles reported the corrosion rates in terms of interaction study. Therefore, it could be beneficial that more studies are to be conducted to gather more information. The objective of this study was to test the null hypotheses about the effects of wire type, pH and immersion time upon the means corrosion rates and investigate the interactions between these factors as well as the effects of individual factor. 4. Titanium-molybdenum alloy (TMA) arch wire (Ormco, CA, USA). The surface composition percentage was obtained by evaluation of these alloys using the Energy Dispersive Spectroscopy (EDS) analysis (Model 7021-J, Horiba Ltd., Kyoto, Japan). The arch wires were immersed in artificial saliva. The chemical composition of the artificial saliva was modified Fusayama solution . The composition was NaCl (0.4g/L), KCl (0.4g/L), CaCl2·2H2O (0.795g/L), NaH2PO4·H2O (0.690g/L), KSCN (0.3g/L), Na2S·9H2O (0.005g/L) and urea (1.0g/L). The electrolyte was adjusted either at pH 6 or pH 2.5. Each specimen was immersed in a glass cell vessel which contained 200ml of artificial saliva at 37 °C. The immersion interval was either at as-received or at 90 days. The testing apparatus consisted of a corrosion cell, the Auto lab testing machine PGSTAT20 and the General-Purpose Electrochemical Software (GPES) package (AUTOLAB, Netherlands), which recorded the corrosion behavior and performed the linear sweep voltammetry . Determination of the open circuit potential (OCP) was done over a 30-minute period with a scanning rate of 1mV per minute. The polarization curves were assessed between +/- 150mV of the open circuit potential in order to obtain the corrosion and breakdown potentials. The GPES computer program determined the corrosion potential by plotting the slope of the polarization curve. The corrosion potential was then used for calculation of the corrosion rates of wires (mm/year), by adding prerequisite parameters which were surface area, the equivalent weight, and density. The values used for calculation are shown in Table 1. Data analyses were performed with statistical software SPSS 14.0. 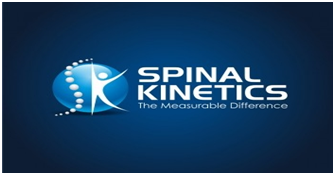 (SPSS Inc, Chicago, IL, USA). Descriptive mean corrosion rates and standard deviations were calculated for all experimental groups. In order to fit the dependent data with the assumption for general linear model, preliminary examination of the data required exclusion of some outliers. Therefore, the final number of specimens were as shown in Table 2. To run the analysis, log-transformed corrosion rates data was used. Levene’s test of equality of error variances demonstrated homogeneity of variances (P=0.13). Besides, the spread-versus-level plots revealed that there was no pattern for distribution of means and the standard deviations. So, the equal variances assumption was not violated for the variables. The General Linear Model procedure, multivariate analysis, was used to test the null hypotheses about the effects of wire type, immersion time and pH on the log mean corrosion rates. Full factorial model with Type III sum-of-squares method were selected for statistic calculation. Post hoc multiple comparison test (Tukey’s) was performed for the baseline (as-received and pH 6) and the interaction effects. Scanning electron microscope (S-3000N, Hitachi Corp., Japan) was used to examine the corroded surface in each wire group. All specimens were labeled, and gold spluttered before being subjectively examined. The results of the EDS testing for the surface chemical compositions of each wire alloy are listed in Table 1. The values were generally like the previous studies . 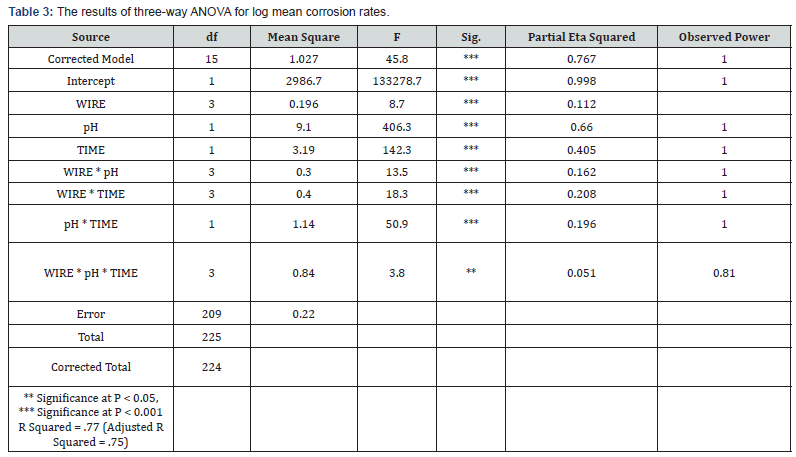 Table 2 shows the mean corrosion rates and standard deviations classified by independent variables. Results of three-way ANOVA (Table 3) rejected the null hypotheses which indicated that all variables and their interactions significantly contribute to the model. Statistically significant differences among the log mean corrosion rates (P < 0.05) was found for the main effects, the second order interaction and the third order interaction. The relative extent of variables contribution to the model could be seen from the partial eta squared (Table 3). It could be interpreted that pH contributed most to the model (.660), followed by immersion time (.405). Whereas the wire x pH x time (.051) contributed least to the model. Post hoc multiple comparison test (Tukey’s) among the 4 orthodontic wires at baseline (as-received, at pH 6) and interaction effects were shown in Table 4 and Table 5 respectively. Post hoc test contrasting the main effect revealed that the mean corrosion rates of pH 2.5 was greater than pH 6, and the mean corrosion rates of 90-day immersion time was also greater than as-received (P < 0.05). Figure 1A is the interaction plots between mean log corrosion rates (ordinate) and the 4 as-received orthodontic wires (abscissa), contrasting pH 2.5 and pH 6. Figure 1B is the interaction plots between mean log corrosion rates at the 90 days immersion-time orthodontic wires contrasting pH 2.5 and pH 6. The non-parallel lines in the two figures indicated interaction between these variables. As shown in Figure 2, for as-received and pH 6 status (1st row), Aus wire shows remarkable longitudinal grooving, as a result of being drawn during production. NiTi shows the amorphous and smoothest surface. SS shows tiny pits and shallow grooves while TMA shows the largest pores and deep grooves. The most striking surface change was observed in 90 days at pH 2.5, especially for Aus. NiTi surface, however, showed the least change. The results of this study indicated that wire type, pH, immersion time and combination of these factors accounted for significant differences of mean corrosion rates. The greatest impact was pH, followed by time and the least was the wire*time*pH. In general, the interaction of pH 2.5 or 90 days immersion time upon the asreceived orthodontic wires resulted in increased mean corrosion rates. Dramatic change of mean corrosion rates was shown for all orthodontic wires when subjected to pH 2.5 and 90 days immersion time (Figure 1B). SS was significantly most affected by pH 2.5 and 90 days immersion time than the other three orthodontic wires (Figure 1B), (Table 5). Consequently, relative ranking of mean corrosion rates of all 4 orthodontic wires subjected to these two variables were differentially changed compared to the as-received status. 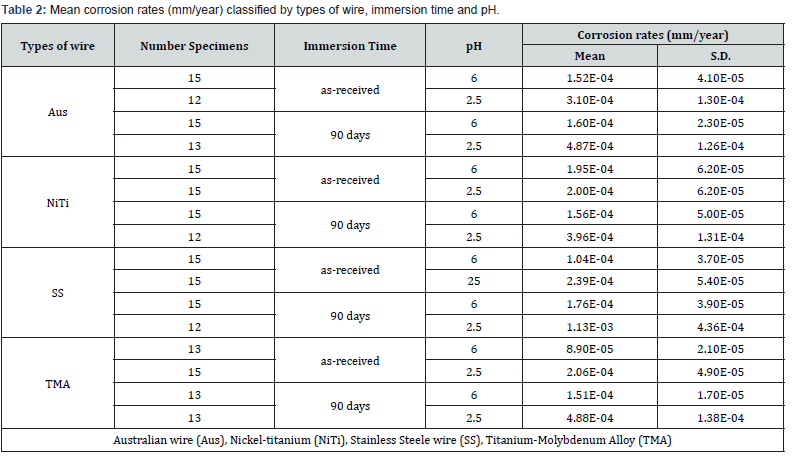 Comparison of mean corrosion rates across wire type for the as-received wire at pH 6 showed that NiTi was the highest, followed by Aus, SS and the least was TMA respectively (Table 4) and (Figure 1A). These results were partly in agreement with many studies [17,18]. Our result supported the findings by Sarkar et al. and Hunt et al. who reported the relative corrosion rates of NiTi was greater than SS/Aus and then TMA [17,18]. However, our results did not support Rondelli  who reported that NiTi had better corrosion resistance than stainless steel. This contradicting might be due to different NiTi components which were reported to show large variety among brands [7,22]. Orthodontic wires are subjected to corrosive environment in the oral cavity. Many ingested fluids can be corrosive because of their low pH, for example, fruit juices, vinegar, acidic carbonated drinks [23,24]. Fluoridated mouthwash could also create acidic environment. Reduction of pH may dissolve the surface oxide films and prevent its reformation which results in greater corrosion. This may explain why the PH 2.5 group showed significant higher mean corrosion rate than pH 6. This finding agreed with various reports [10,25,26]. Moreover, the 4 orthodontic wires in our study showed differential corrosion susceptibility when subjected to pH 2.5 (Figure 1A). The highest change which indicated the most susceptibility was found for SS, followed by TMA, Aus and NiTi respectively. Regarding the immersion time, 90 days was chosen for this study as this may represent the average period that an orthodontic wire may be used in oral cavity before changing to a new stiffer wire. Interaction of pH 2.5 and immersion time for 90 days had significant influence by increasing corrosion rates of all 4 orthodontic wires, however with different susceptibility. The highest change which indicated the most susceptibility was found for SS, followed by TMA, Aus and NiTi respectively. Reduction of pH could destroy surface oxide layer. In addition, alloy aging may increase surface roughness as time went by, resulting in oxygendepleted area, which cause deeper crevice or pitting corrosion [14,24]. Similar results were reported by Huang et al. who found that the amount of nickel and titanium ions released from NiTi wire in pH ≥3.75 solution at 1 day immersion time was much less than that in pH 2.5 solution, at 28 days. Kwon et al. also reported increase of NiTi arch wire corrosion as the period of immersion in acidic fluoride solution increased and pH value decreased. However, NiTi wire in our study was less susceptible to change in pH than the other 3 wires. However, this result should not be generalized for other NiTi brands. It should be noted that the results of NiTi corrosion were complex and varied greatly because this alloy have been vastly modified for various use in medical and dental fields. Several factors have been reported for some medical devices both in increasing or reducing NiTi corrosion rates, for example, loading, surface treatment, surface coating, sterilization techniques, pH, immersion time [7,10,17-19,22,27]. Consequently, contradicting results were reported in the past [7,17,18]. The difference findings could also be attributed to the formation, thermal process and polishing method of NiTi wire which were different greatly among manufacturers . The results of variables interaction upon TMA should be further studied. It was interesting to observe that pH reduction and increased immersion time could increase TMA corrosion rates in our study. Although the as-received titanium alloys were exceptionally corrosion resistant because of the stability of the TiO2 oxide layer, they are not inert to corrosive attack. When the stable oxide layer is broken down or removed and is unable to reform on parts of the surface, titanium can be as corrosive as many other base metals . Many laboratory studies have also demonstrated that, in a fluoridated, acidic environment, the corrosion susceptibility of titanium was increased [11,29,30]. in vitro studies of corrosion behavior can use various methodologies and outcomes, such as, potentiostatic, potentiodynamic, atomic absorption spectroscopy etc. Corrosion outcomes reported were varied such as Icorr (electric current), Ecorr (corrosion potential), Rp (Polarization Resistance), Bp (Breakdown Potential), μg/cm2. The strength of this study was that the kinetic corrosion reactions of the orthodontic wires with the outcome unit as corrosion rate (mm/year) were used. The findings of interaction of these variables will help adding more information into this field. The weakness of this study was that it was an in vitro experiment. For in vitro study, the decreasing corrosion rate may result from the increase in metal ion contents in the saturated environment of artificial saliva . This notion was supported by Huang et al. who studied NiTi wire and found that the average ion released per day decreased with immersion time due to the accumulated amount of nickel and titanium ions as time went by. However, this situation does not occur in the oral cavity since these ions could be removed by food, fluids, and the toothbrush which will continue the corrosion . pH 2.5 which was used in this study may be considered as extreme and rarely happened in the normal saliva. However, the values (pH 2.5-6.25) were previously experimented by Huang et al. pH value of 2.5 was also reported for Cola soft drinks by Nordstrom et al. . Inclusion of more orthodontic wires of different brands under various corrosive conditions are suggested for future study. Implication for clinical practice: Orthodontists and patients should be warned of possible risks of wire corrosion when taking beverages, juice and sour fruits with low acidic pH, together with keeping the same arch wire in the oral cavity for a too long period of time, for example, when the patient continuously keeps breaking the appointment. These situations can increase the possibility of wire corrosion, regardless of wire materials. The bottom line is the interaction of several other corrosive factors may reduce passivity of surface oxide layer and modulate corrosion of orthodontic wires. 1. Wire type, pH, immersion time and combination of these factors, both second order and third order interactions, contribute to significant differences of the mean corrosion rates. 2. The mean corrosion rates of the as-received at pH 6 showed that NiTi >Aus >SS>TMA. 3. Corrosion behavior of Aus, NiTi, SS and TMA could change due to interaction of pH and/or immersion time. 4. At pH 2.5 and 90 days immersion time, the susceptibility of these orthodontic wires to corrosion could be modulated. The greatest increase mean corrosion rates were SS. However, TMA, Aus and NiTi mean corrosion rates were not significant different from each other. There is not any conflict of interest exists in this study. Von Fraunhofer JA (1997) Corrosion of orthodontic devices. Semin Orthod 3(3): 198-205. Anusavice KJ, Brantley WA (2003) Physical properties of dental materials. In: Anusavice KJ (Ed. ), Phillips’ science of dental materials. 11th edn. Elsevier Science, Missouri, USA p. 41-71. Eliades G, Eliades T, Vavuranakis M (2003) General aspects of biomaterial surface alterations following exposure to biologic fluids. In: Eliades G, Eliades T, Brantley WA, Watts DC (Eds. ), Dental materials in vivo aging and related phenomena. Quintessence Publishing Co Inc, Hong Kong, p. 3-20. Matasa CG (1995) Attachment corrosion and its testing. J Clin Orthod 29(1): 16-23. Merritt K, Brown SA (1995) Release of hexavalent chromium from corrosion of stainless steel and cobalt-chromium alloys. J Biomed Mater Res 29(5): 627-33. Neumann P, Bourauel C, Jager A (2002) Corrosion and permanent fracture resistance of coated and conventional orthodontic wire. J Mat Sci Mat Med 13(2): 141-147. Kim H, Johnson JW (1999) Corrosion of stainless steel, nickel-titanium, coated nickel-titanium, and titanium orthodontic wires. Angle Orthod 69(1): 39-44. Widu F, Drescher D, Junker R, Bourauel C (1999) Corrosion and biocompatibility of Orthodontic wires. J Mater Sci Mater Med 10(5): 275-281. Jenkins GN (1963) The physiology and biochemistry of the mouth. Blackwell Scientific Publications, Cambridge, UK p. 284-303. House K, Sernetz F, Dymock D, Sandy JR, Ireland AJ (2008) Corrosion of orthodontic appliances--should we care?. Am J Orthod Dentofacial Orthop 133(4): 584-592. Eliades T, Athanasiou AE (2002) In vivo aging of orthodontic alloys: implications for corrosion potential, nickel release, and biocompatibility. Angle Orthod 72(3): 222-237. Kusy RP (1997) A review of contemporary arch wires: their properties and characteristics. Angle Orthod 67(3): 197-208. Acharya KA, Jayade VP (2005) Metallurgical properties of stainless steel orthodontic arch wires: a comparative study. Trends Biomater Artif Organs 18(2): 125-136. Kapila S, Sachdeva R (1989) Mechanical properties and clinical applications of orthodontic wires. Am J Orthod Dentofacial Orthop 96(2): 100-109. Burstone CJ, Goldberg AJ (1980) Beta titanium: a new orthodontic alloy. Am J Orthod 77(2): 121-132. Sarkar NK, Redmond W, Schwaninger B, Goldberg AJ (1983) The chloride corrosion behaviour of four orthodontic wires. J Oral Rehabil 10(2): 121-128. Hunt NP, Cunningham SJ, Golden CG, Sheriff M (1999) An investigation into the effect of polishing on surface hardness and corrosion of orthodontic archwires. Angle Orthod 69(5): 433-440. Rondelli G, Vicentini B (1999) Localized corrosion behavior in simulated human body fluids of commercial Ni-Ti orthodontic wires. Biomaterials 20: 785-92. AUTOLAB (2009) The use of AUTOLAB Electrochemical Instruments in Corrosion Research. Brantley WA (2001) Orthodontic wires. In: Brantley WA, Eliades T (Eds.) Orthodontic materials: scientific and clinical aspects, Thieme, New York, p. 78-103. 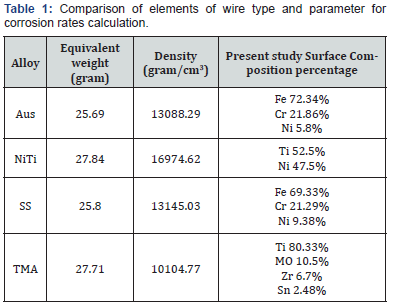 Huang HH (2005) Variation in corrosion resistance of nickel-titanium wires from different manufacturers. Angle Orthod 75(4): 661-665. Phillips R (1991) Skinner’s Science of dental materials. 9th edn. WB Saunders company, Philadelphia, USA, p. 291-302. Barrett RD, Bishara SE, Quinn JK. (1993) Biodegradation of orthodontic appliances. Part I. Biodegradation of nickel and chromium in vitro. Am J Orthod Dentofac Orthop 103(1): 8-14. Buchman DJ (1980) Effects of recycling on metallic direct-bond orthodontic brackets. Am J Orthod 77(6): 654-668. Kwon YH, Cheon YD, Seol HJ, Lee JH, Kim HI (2004) Changes on NiTi orthodontic wire due to acidic fluoride solution. Dent Mater J 23(4): 557-565. Shabalovskaya SA (2002) Surface corrosion and biocompatibility aspects of NiTinol as an Implant material. Biomed Mater Eng 12(1): 69-109. Chaturvedi TP (2009) An overview of the corrosion aspect of dental implants (titanium and its alloys). Indian J Dent Res 20(1): 91-98. Nakagawa M, Matsuya S, Shiraishi T, Ohta M (1999) Effect of fluoride concentration and pH on corrosion behavior of titanium for dental use. J Dent Res 78(9): 1568-1572. Schiff N, Grosgogeat B, Lissac M, Dalard F (2004) Influence of fluoridated mouthwashes on corrosion resistance of orthodontics wires. Biomat 25(19): 4535-4542. Nordstrom DK, Alpers CN, Ptacek CJ, Blowes DW (2000) Negative pH and extremely acidic mine waters from iron mountain California. Environ Sci Technol 34(2): 254-258.